In a 1-quart saucepan, heat the water over medium heat until warm and an instant-read thermometer reads 105°F to 115°F. In a large bowl, dissolve the yeast in the warm water. With a wooden spoon, stir in half of the flour and all of the oil, salt and sugar. Stir in enough of the remaining flour, 1/4 cup at a time, until dough is easy to handle. Sprinkle flour lightly on a countertop or large cutting board. Place dough on floured surface. Knead by folding dough toward you, then with the heels of your hands, pushing dough away from you with a short rocking motion. Move dough a quarter turn and repeat. Continue kneading about 10 minutes, sprinkling surface with more flour if dough starts to stick, until dough is smooth and springy. Spray a large bowl with the cooking spray. Place dough in bowl, turning dough to grease all sides. Cover bowl loosely with plastic wrap; let rise in a warm place 20 minutes. Move the oven rack to the middle position of the oven. Heat the oven to 425°F. Place dough on center of an ungreased cookie sheet or 12-inch pizza pan. Press the dough into a 12-inch round, using floured fingers. Press dough from center to edge so the edge is slightly thicker than the center. Spread the pizza sauce over the dough to within 1/2 inch of edge. 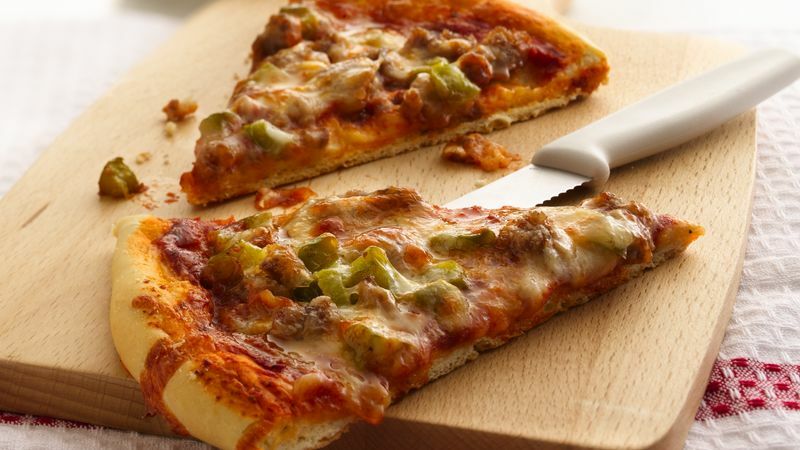 Add the toppings for either cheese, hamburger, Italian sausage or pepperoni pizza. Bake 15 to 20 minutes or until crust is golden brown and cheeses are melted and lightly browned. Sprinkle pizza sauce with 3 cups shredded mozzarella cheese (12 oz) and 1/4 cup grated Parmesan cheese. In 10-inch skillet, cook 1 lb lean (at least 80%) ground beef, 1 cup chopped onion and 1 teaspoon Italian seasoning over medium heat 8 to 10 minutes, stirring occasionally, until beef is thoroughly cooked. Pour into paper towel-lined strainer to drain. Spread beef mixture over pizza sauce. Sprinkle with 2 cups shredded mozzarella cheese (8 oz) and 1/4 cup grated Parmesan cheese. In 10-inch skillet, cook 1 lb bulk Italian pork sausage and 1 cup chopped green bell pepper (if desired) over medium heat 8 to 10 minutes, stirring occasionally, until pork is no longer pink. Pour into paper towel-lined strainer to drain. Spread sausage mixture over pizza sauce. Sprinkle with 2 cups shredded mozzarella cheese (8 oz) and 1/4 cup grated Parmesan cheese. Arrange 1 package (3 oz) sliced pepperoni over pizza sauce. Sprinkle with 2 cups shredded mozzarella cheese (8 oz) and 1/4 cup grated Parmesan cheese. Place the dough from center to the edge to form a 12-inch circle, using floured fingertips. The edge should be slightly thicker than the center to help hold the filling.